Pop it in your diary: Saturday 10th March 2018, 10am-4pm, Derby Market Place & QUAD, Cathedral Quarter Derby, Derbyshire, UK. You can download our poster above – do print, share, display & spread the word! FREE entry – donations appreciated. All genders, all communities together with lots for children to enjoy including soft play area. Celebrate with uplifting performances, 40+ stalls & activities, arts & crafts, sports, exhibitions & family fun under a huge marquee on Derby Market Place – the same spot where the Suffragettes spoke in our city. There is a free crèche on the day run by Orchard Garden Day Nursery at QUAD for children from 2 months to 12 years of age, subject to availability and limits upon length of booking. Advance bookings or enquiries can be made by calling 01332 370497 or on the day. 12pm: Get Inspired: Rebel Women past and present – our inspiring panellists discuss their favourite HERoes from HERstory and today – share yours too! For: everyone. 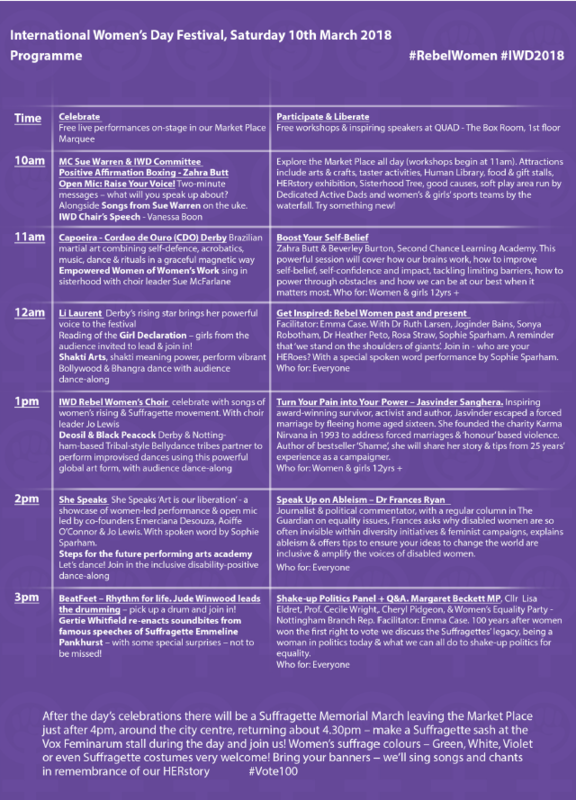 After the day of festivities we will have a Suffragette Memorial March, marking 100 years since the first women won the right to vote in the UK, meet at 4pm – Waterfall, Market Place to join the march of about 20-30mins around the city centre – bring a banner, sing along, wear purple or even dress as a Suffragette. You can make a Suffragette sash during the day at the Vox Feminarum stall.